Blue skies, sunshine, warm summer breezes. If the winter doldrums have you looking toward warmer days with anticipation, then do I have some news for you. 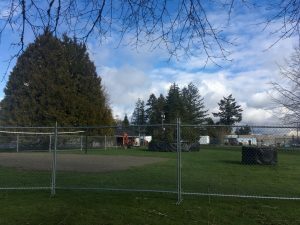 Work is currently underway for the City of Olympia’s new sprayground in Woodruff Park. If you’ve driven or walked down Harrison Avenue recently, you may have noticed the temporary construction fencing blocking off most of Woodruff Park. That’s because construction to upgrade the park with a new sprayground just recently began. But what’s a sprayground? I’m glad you asked. A sprayground is a playground with water features designed to spray, sprinkle, drip, and drop water on children, popular on hot summer days. Woodruff Park was chosen for the new sprayground for a number of reasons. “Several parks were evaluated for feasibility in siting the sprayground,” explains Lund. “Woodruff Park was ultimately chosen because of the size and sunny exposure of the park.” The park also has an existing building that could easily be retrofitted for restroom and mechanical needs. A close proximity to Garfield Elementary School to share parking during the summer months and easy accessibility to public transportation were also factors that led to the new sprayground’s placement. The selected sprayground was chosen from three possible designs, after a public vote in 2017. 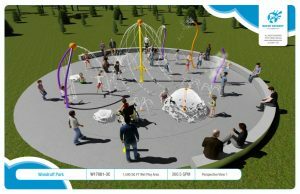 The sprayground at Woodruff Park will have a recirculating water treatment system similar to the one at Heritage Fountain. This system will be housed in the existing building. Heather Matthews is a parent of two children, age four and seven. She is happy to hear about the new sprayground upgrade. “I think Woodruff Park is a great location for a sprayground,” she says. “I’m really excited about these new water features, as we don’t have a public pool for kids to cool off in the summer.” Matthews also thinks it will be nice to have a local park with a water feature, so she doesn’t have to travel so far to outside communities like Tacoma or Chehalis. In the future, she would like to see more water recreation options like a public pool or swimming at Ward Lake. On top of the new sprayground, the park will see some other upgrades. Parking and restrooms will be upgraded for ADA accessibility. 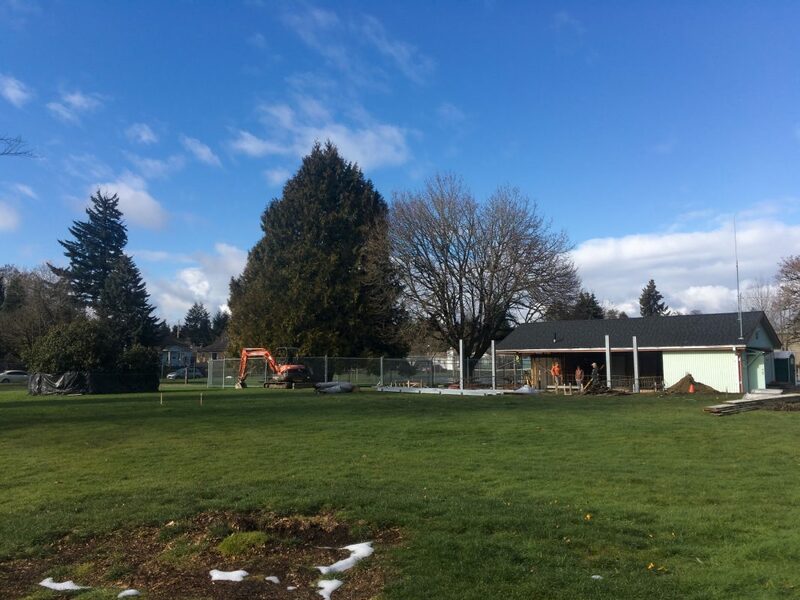 Asphalt pathways and an open frame picnic shelter facing the sprayground will be constructed by summer. 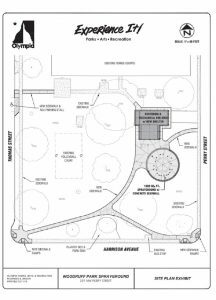 The tennis courts at Woodruff Park will also receive a facelift with a new surface, pickleball and tennis lines, and a new fence. Tennis court work is expected to be completed by fall. Exceptionally cold and snowy, winter weather has delayed the park renovation by a week or so, but the project is still expected to be complete by late April or early May, with an anticipated opening day in June this year. The sprayground will operate every year, from Memorial Day to Labor Day. The new upgrades at Woodruff Park are made possible by a matching grant of over $440,000 from the Washington State Recreation and Conservation Office. The sprayground equipment vendor Water Odyssey has other similar spraygrounds in Pierce and King Counties. The contractor on the project is Berschauer Construction of Olympia. If you plan to visit Woodruff Park before construction is finished, remember that most of the park is fenced off. The tennis courts are still open, but restrooms are closed and unavailable until construction is complete. And once the sprayground is open, remember to slather on that waterproof sunscreen regularly. The only thing less fun than being stuck inside on a dreary winter day, is being stuck inside on a nice summer day with a sunburn. To get more information, or to read updates on sprayground opening dates, check out the City of Olympia Parks, Arts and Recreation Website.